Reference is invited to para-8 of DOP & PW O.M. F. No.4/34/2002 -P&PW(D)- Vol- II dated 23/06/2017 vide which it has been decided to extend the benefit of order dated 02-08-2007 of the Hon’ble Madras High Court and the Order dated 01-09-2016 of the Hon’ble Supreme Court to all similarly placed absorbee pensioners. Accordingly, all such absorbee pensioners who had taken 100% lump-sum amount in lieu of pension on absorption in PSUs/Autonomous Bodies and in whose case 1/3rd pension had been restored after 15 years, may be allowed restoration of full pension after expiry of commutation period of 15 years from the date of payment of 100% lump-sum amount. 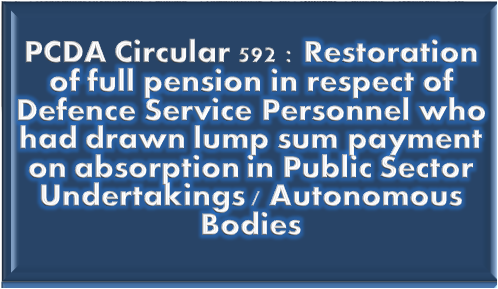 Armed Forces PSU absorbees whose full pension is restored in terms of the above instructions would also be entitled for revision of their pension in accordance with the instructions issued from time to time in revision of the Pay Commissions including 7th Central Pay Commission.